There are many ways to save now that require a smartphone (aka phone that can access the internet), but the cost of the monthly data plan for the phone can never really equal the savings. Let me repeat that… getting a smartphone just to save money on groceries is not going to pay off. If you are still old school with a phone that doesn’t access the internet then I applaud you for being more frugal than most of us! 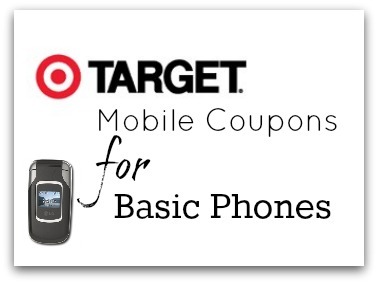 As a reward for your frugalness I want to show you how you can still take advantage of all the awesome Target mobile coupons without having a Smartphone. There is one thing you need to get though and that is up to 5 text messages a month from Target. Even if you pay 10¢ a message, this will pay for itself in savings, I promise. You’ll get a text message right away that you are enrolled. Then 2-3 minutes later another text message will come with your first set of coupons. 1. Copy the text message (every phone will be different on how to do this). Open up a new text message and paste the message that just came in it. Then send the message to your email address. For most every plan you should be able to do this. You’ll get an email from your phone number with the URL that Target just sent you. On your computer click on the URL. 2. Just type the URL into your web browser by hand. Once you open the link, however you choose to get it to your computer, print the web page. It is a mobile page (long and skinny) but the barcode will work perfectly in the store just as if you used it on your phone! If you have any issues with it, the fine print at the bottom of your page instructs the cashier to manually type in the barcode. You will receive a new text message from Target with new coupons every other Saturday. You can also get additional text messages and more coupons by texting the words CHEESY, BABY4 and UPUP right now. Keep in mind these special words change every few months.